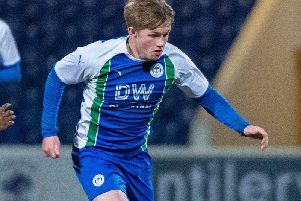 Latics wonderkid Joe Gelhardt scored a crucial late goal to help send England through to the Under-17 Euro Finals in Ireland after a 3-2 win in Denmark. Gelhardt had only appeared off the bench with 18 minutes remaining and England 1-0 down to Mads Zaar’s goal just after the hour mark. Arsenal midfielder Nonso Madueke made it 1-1 with 10 minutes to go, but that was only the start of the drama to come. Gelhardt nosed England in front with three minutes to go after good work from Morgan Rogers, but Denmark levelled through Wahidullah Faghir as the game entered added time. With England needing to win to go through, they threw everything forward for one last attack, and were rewarded when Madueke struck again in the second added minute. Another Latics man, Jensen Weir, played 56 minutes in the engine room before being substituted. The Euro Finals take place in Ireland between May 3-19.